Be original in the bedroom with this three-piece duvet cover set. 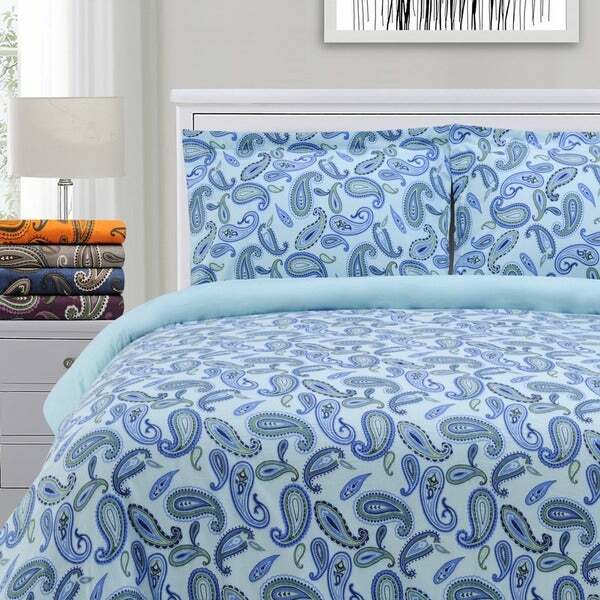 Featuring a unique paisley pattern and a convenient button closure, this reversible bedding adds an imaginative style that extends to the whole room. Its woven 100-percent cotton material is soft, breathable and machine-washable, making care for the whole set quick and easy for years to come. This is the second duvet cover of this brand I've purchased. The colors are beautiful, they wash well, and are nice and warm and toasty for cold winter nights. I ordered this in orange, and I really like it. I needed a new duvet cover for my down comforter and I love flannel and the color orange, so this cover is perfect for me! The flannel is soft and of medium thickness and the colors really pop; the orange has green and reddish-brown hi-lights in the paisley pattern. There was one surprise, the pattern is only on one side of the outside of the cover, the other side is solid orange. I was sort of disappointed by that because it isn't mentioned in the description, I was expecting the paisley pattern on both sides of the cover. But, this way it's "reversible". 6 oz. flannel 2 twin sets on a queen bed! We each have our own pillow shams and twin comforters on my own flannel fitted sheet. This way nobody is stealing the blankets, we each have our own!! This is just what I was looking for - an all-cotton comforter cover. It is warm and cozy flannel in vibrant colors. It fits just my down comforter just right. If you live in area where it snows in the winter, you need a flannel comforter cover! This lovely duvet is so soft and adds warmth to your down comforter. It makes for an outrageously soft and warm cocoon that you will not want to leave in the morning! Very cozy and comfy! Great colors! Love my duvet covers! I am always a fun of Flannel. Over the years I have purchased different flannel sheets from a lot of different brands and places but I have to say this one is the softest and comfortable duvet I have ever had. Feel heavenly soft next to the skin. I definitely recommend this to everyone who love comfortable fabric. Very pretty set, love the pattern and colors. Not sure if these are 'true' flannel, though. Almost seems more like a brushed cotton. Very nice, but if you are looking for a heavy winter flannel, this is not it. I love it. It’s prefect for my. Newly painted bedroom! Poor quality! Not soft even after washings! Too stiff! Love the colors and the softness. The purple and the green are very deep and dark. It washes up well and has a good quality. If you are on the fence, I would say buy it as it is worth it. This cover washes up very nicely, our little dog sleeps with us so it gets washed several times through the winter when we use it. It is easy to get the comforter back into it and has maintained its softness and shape very well. The price was good too. Ssince we live in Massachusetts where there are massive amounts of snow I wanted the the person I am the Social Security Payee for to be warm and comfortable when he sleeps especially with up coming surgery this winter. "Can shams be bought separately?"